Rising demand of dust suppressing chemicals at construction sites, cement plants, unpaved roads, mining operations, and other critical application areas are driving the market growth. Stringent legislation imposed on the emission of dust particles and air pollution is again pushing the market growth. Also, the rise in mineral and metal mining activities is generating demand for dust controlling system. Moreover, the rising prevalence of pulmonary disease and respiratory infections among the workers is again generating high demand for dust suppressants. The latest report by Value Market Research expects the Global Dust Suppressant Market to reach USD 10.1 billion by 2025. It was valued USD 4.3 billion in 2018. The report foresees a 13% CAGR from 2019 to 2025. By nature, wet suppressant emerged as the leading nature segment owing to the cost-effective solution over dry suppressants. Excellent ability to suppress dust emission at construction sites, mining and manufacturing plants is driving the segment growth. On the basis of type, polymer emulsion has dominated the segment in 2018. Growing demand from paints & coating, personal care products, pulp & paper industries is driving the segment growth. Owing to low VOC content, better recyclability, and shelf life, polymer emulsion is gaining huge traction from the end-use industries. In 2018, construction led the end-use segment by accounting major market share. Growing spending on commercial, residential and industrial infrastructure is driving the segment market. Rapid urbanization and industrialization have contributed to the growth in the construction industry. Geographically, Asia Pacific held the significant market share in 2018. Booming construction, mining & refining activities, the manufacturing sector is generating high demand for dust suppressant. Growing awareness regarding health hazards caused by dust particles among the workers’ is again pushing the market growth. Also, ongoing development to improve soil management practices is projected to propel the regional market growth. Major players of the market are Archer Daniels Midland Company, Benetech Inc., Borregaard LignoTech, Cargill Incorporated, Chemtex Speciality Limited, DowDuPont Inc., GelTech Solutions, Hexion Inc. and Huntsman International LLC. 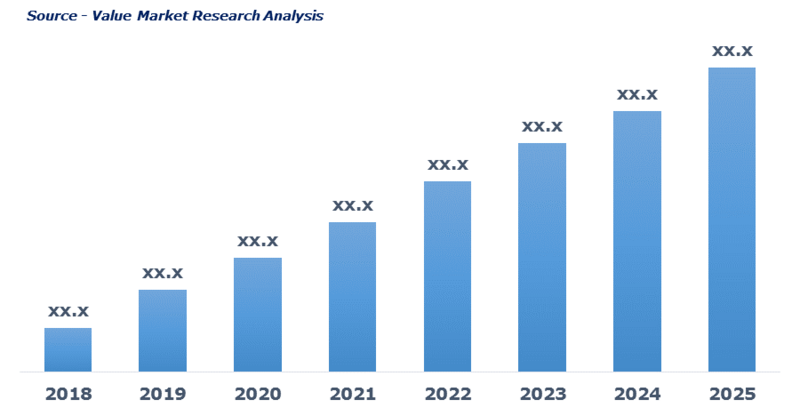 As per this study the Global Dust Suppressant Market was valued USD 4.3 BN (by revenue) in 2018 and is anticipated to reach USD 10.1 BN by 2025 with a CAGR of 13%. Dust suppressant chemicals are basically used to control dust across the area like roads, the cement industry, and the mining industry. They can range from water to palliative compound which includes saline solutions based on magnesium chloride (MgCl2), calcium chloride (CaCl2) and sodium chloride (NaCl). Also, asphalt emulsions and lignin, plant oils and natural clays are also categorized under dust suppressant materials. Chloride-based and water are considered as the two most common types of dust suppressant. The global dust suppressant market is presumed to grow significantly during the forecast period owing to the rising awareness regarding dust suppressant chemicals in manufacturing and mining industries. Also, growth in investments in civil infrastructure is important aspects fueling the market growth. The growth of end-user industries like cement, construction, and mining is again expected to boost market growth. However, shortage of skilled labor and lack of awareness among people is expected to hinder the market growth. This detailed market study is centered on the data obtained from multiple sources and is analyzed using numerous tools including porter’s five forces analysis, market attractiveness analysis and value chain analysis. These tools are employed to gain insights of the potential value of the market facilitating the business strategists with the latest growth opportunities. Additionally, these tools also provide a detailed analysis of each application/product segment in the global market of dust suppressant. The broad dust suppressant market has been sub-grouped into nature, type and end-use. The report studies these subsets with respect to the geographical segmentation. The strategists can gain a detailed insight and devise appropriate strategies to target specific market. This detail will lead to a focused approach leading to identification of better opportunities. Furthermore, the report comprises of the geographical segmentation which mainly focuses on current and forecast demand for dust suppressant in North America, Europe, Asia Pacific, Latin America, and Middle East & Africa. The report further focuses on demand for individual application segments in all the regions. The report also covers detailed competitive landscape including company profiles of key players operating in the global market. The key players in the dust suppressant market include Archer Daniels Midland Company, Benetech Inc., Borregaard LignoTech, Cargill Incorporated, Chemtex Speciality Limited, DowDuPont Inc., GelTech Solutions, Hexion Inc. and Huntsman International LLC among others. An in-depth view of the competitive outlook includes future capacities, key mergers & acquisitions, financial overview, partnerships, collaborations, new product launches, new product developments and other developments with information in terms of H.Q.